THE public will be able to have its say on the recently-released Draft Esplanade Precinct Concept Plan during a "community walk and talk" this Tuesday at 6pm. 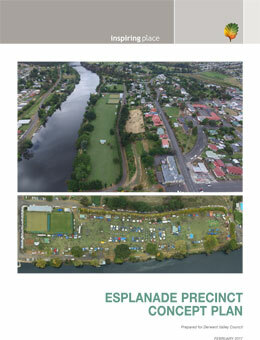 Derwent Valley Council general manager Greg Winton told this month's council meeting that the purpose of the Esplanade Precinct Concept Plan was to help the council to secure a promised $600,000 in federal funding for the upgrading of the infrastructure and facilities on the Derwent Esplanade at New Norfolk. Mr Winton said it was proposed to combine the federal funding with an earlier State Government election promise of $300,000 for a marina on the Derwent to produce a project valued around $1 million. The project could exceed $3 million if combined with the proposed relocation of the New Norfolk Rowing Club to the southern bank of the river. Those at the council meeting heard that although the draft concept plan had already been provided to the Federal Government, the consultants who developed the $20,000 plan intended to hold a “community walk and talk” at the Derwent Esplanade on Tuesday, March 28, starting at the Ferry St pontoon at 6pm. The draft concept plan has also been advertised for public comment for a period of 42 days closing on May 3 and can be obtained from the council office or downloaded here. Is it 6pm or 7pm? Sorry for the confusion, it's 6pm. Have you seen this car?